In the last decade, marketing has changed beyond all comprehension. The rise of digital, big data, programmatic, addressable et al have given marketers a multitude of opportunities, the number of which continues to dramatically grow. Like an all you can eat buffet, the choice can be both exciting and overwhelming; it’s very easy to make rash, regrettable decisions. There has been a similar rise in marketing analytics techniques. It has never been easier to see how well your marketing investment is performing, in clicks, likes, sentiment, web visits, phone calls, applications, sales, profit. But too many of these techniques focus on easily measurable metrics, which often give an alarmingly short-term view. To counter this, Gain Theory has run a study which looks at the long-term impact of marketing, across a range 7 key categories and 29 brands. The aim is two-fold: to show how marketing impacts business revenue and profit in the long term; and to show how marketers can make the right decisions to drive long-term growth. We believe this is key to the future success of the advertising industry. If we continue to focus on short term metrics, we miss the full picture. For instance, across the brands Gain Theory analysed, digital attribution was shown to measure only 18% of the full long-term impact of marketing on sales. Econometric techniques bridge the gap, but only get us 42% of the way there. Only by looking at marketing through a long-term lens can we truly understand the full impact. The aim of Gain Theory’s Long Term analysis is to measure and understand the Long-Term Multiplier (LTM) to short term impact. To understand how it works, let’s run through an example, and say that a brand ran a £5m TV campaign. Econometric analysis could measure its short-term impact at (for example) £10m in value sales, thus giving a short-term ROI of £2 (£10m value sales divided by £5m spend). The LTM tells us how much this impact grows in the long term. 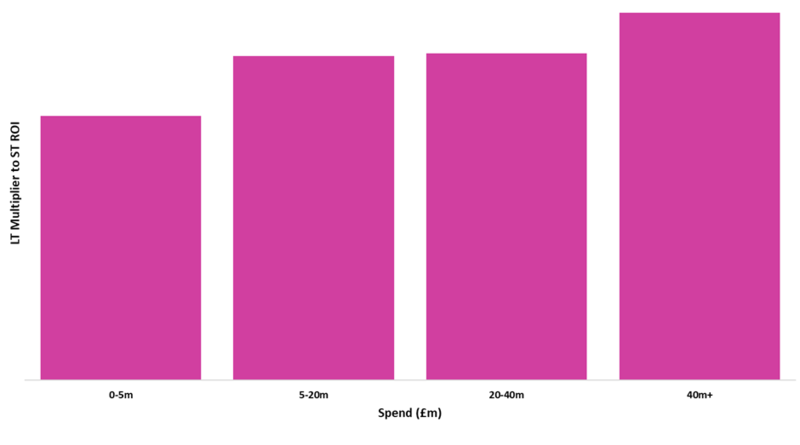 If we measured a LTM of 3x, then this would be because the long-term impact of the campaign was £30m. Please note, this is total so the £30m includes the initial £10m short term impact. The overall long-term ROI is £6 (short-term ROI of £2 multiplier by 3). The LTM is measured by analysing the base – i.e. the level of sales return in the long-term if a brand ran no marketing, which can be seen as a measure of a combination of mental and physical availability, or brand strength. Standard econometric practise is to use a flat base, which does not move over time. However, one of marketing’s functions is to change tastes and preferences in the long term. So if we allow the base to change in the long term, we can reflect these long term movements in tastes and preferences. And if we can understand how marketing impacts the base then we can show how many long-term sales were driven by marketing, giving us the long-term multiplier. Gain Theory has run this analysis across 29 brands to understand the trends at a macro level. 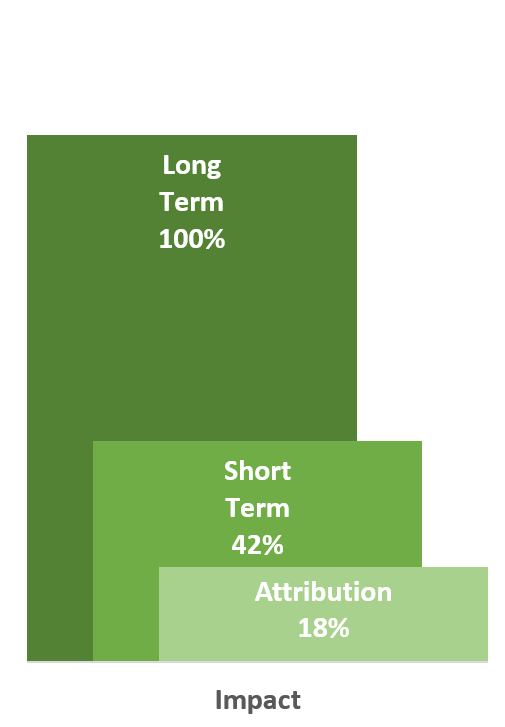 How do advertisers drive long-term sales? What media channels have the biggest impact on long-term sales, and thus the highest LTM? How can marketers use this information to their benefit, to drive long-term business health? TV also has the highest efficacy, with its 25% point (e.g. the point at which 25% of LTMs are higher, and 75% are lower) being higher than all other media at 3.87; the next highest is VOD at 3.52. As seen above, the LTMs for Search, Display, and Radio are at the lower end of the spectrum, whereas TV, VOD, Print, and OOH are in the top 4 across categories. There is clearly important for CMOs and CFOs alike. If certain media are driving high short-term returns but have a limited long term impact, and if we’re only measuring the short-term impact, we are likely to be missing out on large potential long term revenue drivers, potentially causing harm to the business. The strongest drivers of LTM are levels of brand media investment, and the number of bursts of activity. Where we have seen brands invest in media such as TV, VOD, Print, and OOH, at a level which is over and above their competitive set, we have seen higher LTMs than where investment has been under that seen in the competitive set. Additionally, there are benefits to persisting with a campaign. 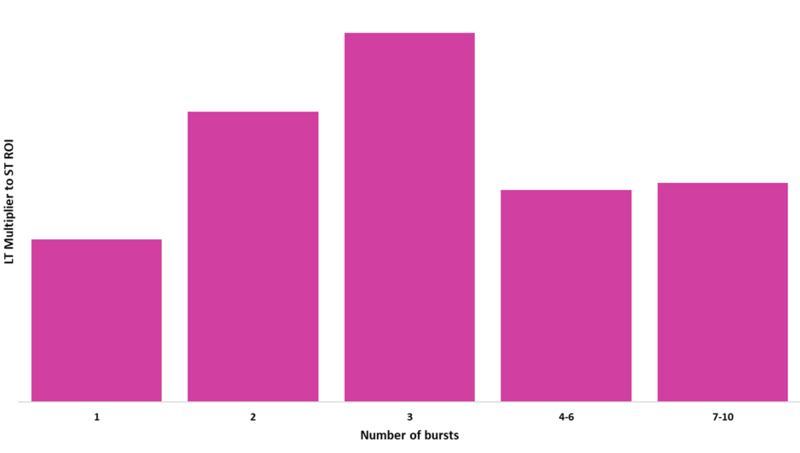 The LTM from running three bursts is double that of a campaign which only has one burst of activity. 4. Which factors indicate long term effect? What tools can marketers use to understand if their marketing is having an impact in the long term? The greatest indicator of long term effect from media is the level of base sales, as Gain Theory has modelled here. However, this can take time to observe as base shifts are measured in months and years, and can often require advanced statistical techniques. Brand metrics often give a guide to long term brand strength. While the choice of brand metrics can be overwhelming, with many advertisers running surveys with hundreds of questions, it is normally a small range of metrics which provide this guide. In 65% of cases, consideration forms the closest link to base sales, where growth in consideration causes growth in the base. The level of impact form consideration differs from industry to industry and brand to brand, but a guide is that a 1%pt increase in consideration can be expected to drive a 0.5 – 2% increase in base sales. A slightly more advanced method is to observe a small basket of metrics, generally comprising awareness, consideration, and those brand metrics which have a close link to base sales. These will differ by brand and industry, but commonly used brand metrics include value for money, trust, and service. Tracking a basket can give a business a ‘campfire’ number – easy to track and observe whilst indicating long term success. Indeed, for a number of large advertisers, while growth in brand metrics is always welcomed, a lot of advertising spend is aimed at maintaining the brand, the base sales, and ultimately the business. (see next section). Another way in which long term health can be measured is by analysing price elasticity over time. The theory is that consumers will overlook price differences for a brand which they believe is higher quality, or a brand in which they have more trust – e.g. Boots own-brand Ibuprofen vs Nurofen; the products are the same, the price points are vastly different. This has been shown in a number of Gain Theory case studies. In one FMCG case study, the price elasticity went from -1 (e.g. a 10% rise in price causes a 10% drop in units sold) to -0.4 (a 10% rise in price causes a 4% drop in units sold). This happened over a three year time period in which the brand went from minimal brand advertising to a relatively consistent presence on TV & VOD. It is rare, but not impossible, for brands to stop investing in brand media to save money. Below are three cases where this has happened and the warning signs advertisers can take from each case. A retail bank had been advertising on TV & VOD consistently for two and a half years. In March 2013, they stopped and went dark for two years. There was an immediate short term impact as sales caused by TV dropped. But the long-term base impact was stark. Over two years their base dropped from 20,000 quotes a month to 11,000. They were still able to generate quotes using other channels – but their efficiency reduced: e.g. generic paid search cost per quote increased by 20%, reflecting findings from section 4.3. A different financial services brand had been advertising on TV & VOD consistently, then stopped. They started advertising again after 2 years off air. Short term results were good: they saw the same cost per application and the same % uplift from TV. But their base had halved. It took 3 years to rebuild their base to pre-dark levels, using a continuous level of brand media to do so. A US-based travel brand took $3.4m out of their TV budget to save money. They lost 41,200 transactions in the short term, equivalent to $3m of profit. So the net impact was $0.4m profit added to the bottom line. However, this brand did not account for the long-term impact. Taking base deterioration into account, the total long term transaction loss was 81,600, equating to a $4.5m loss in profit. The net loss from going off TV was -$1.1m. As has been shown above, brand advertising can have a significant long-term impact, which is often missed by short-termism in marketing measurement. There are ways to understand the long-term impact, either by modelling, or by analysing brand metrics, price sensitivity, or activation media. When undertaking this analysis, it can be shown that the media channels which drive long-term impact are those which have the time and space to tell a story and to embed themselves in consumer minds. Gain Theory’s analysis shows that, due to these features, TV is likely to be the best channel to drive long-term impact and, alongside it, business success. In this world of multiple metrics and big data it can be easy to retreat into short-termism and easy to measure metrics. We encourage all advertisers to take a longer view to represent the full impact of marketing – otherwise we are doing the whole industry a disservice. Simply improving sales and showing you’ve done so is no longer enough, Marketing Managers must also be able to demonstrate greater value and prove the true impact of every element of their activity – from email campaigns and online banner ads, through to direct mail and TV advertising. With marketing departments facing increasing internal pressure from their become vitally important to identify new mechanics that can meaningfully justify their spend to the Board, particularly as marketing is now being seen more as a cost that can be cut than an on-going investment. So why not treat this spend as you would any other cost to the business, by relating it back to the bottom line and, more importantly, the share price? We all think about the bottom line, but share price isn’t normally factored in directly. Lately, I’ve started thinking that it should (and could) be. Measuring the short-term effect of (for example) an advertising campaign is important. Among other things, it allows marketers to evaluate and amend what they are doing as the campaign progresses; however, short-term measurement doesn’t help when it comes to understanding the bigger picture. Even when long-term effects are measured under-reporting of the true financial impact is likely. Why? Because standard approaches fail to take into account the potential impact on a company’s share price. This isn’t because it’s not viewed as being important, it’s more that no one has put forward a method to measure it accurately. Imagine the scenario; your Finance Director (FD) needs to cut back on spending. They identify the areas where they might be able to reduce costs and then stop and ask themselves, should I get the Marketing Manager to cut their budget? Now, on first reflection, it might appear to them that the risk of cutting this type of spend is comparatively low. Do this and the bottom line will instantly look a lot healthier. But this got me thinking, is this really providing an accurate picture? Can this be properly evaluated? A simple mathematical approach reveals such measures to be a false economy. We can add in additional detail like deleveraging and interest payments as well as the impact on investor sentiment, but these are details and don’t affect the thrust of the argument. I think this method makes it possible to track marketing effectiveness back to the share price. If you consider that your marketing activity usually creates (for example) a 2.5 return in terms of margin, cost cutting of this type starts to look less appealing. If your annual marketing budget is £10m and you decide to halve it, that £5m cut may increase your cash flow in the short-term and win you favour with the Board. However, the long-term impact is a £12.5m drop in profit and a net loss of £7.5m. Therefore, what seemed like a clever cost cutting mission to begin with actually costs the business money. Your business might end up losing more money than it saved. As the table shows, the potential loss working through a lower share price and market capitalisation is actually closer to £60m than £7.5m. All other significant investments are evaluated in terms of their impact on profit, with calculated internal rates of return and the opportunity cost of the capital invested. Why don’t we look at marketing in the same way? Is this too much of a simplification? Are there other variables to be looked at that I’ve failed to mention? I’d welcome your thoughts. It was David Bowie who said, “you can’t stand still in one point your entire life.” And with Bowie’s words ringing posthumously in our heads, the same can still be said for marketers. For several years now, we’ve been hearing about the so-called inevitable extinction of the CMO or how many are morphing into another alias – Chief Data Officer, Chief Customer Officer and more recently, the Chief Growth Officer. Ever since the birth of mass advertising, arguably when the first advert popped up on Americans’ TV screen in 1941, advertising and marketing has constantly had to adapt and change to suit new mediums and an increasingly savvy audience. Whilst it’s easy to veer into debate about a marketer’s alias, one thing remains constant: Marketing and marketers exist to drive growth. The biggest headache for many marketers nowadays isn’t necessarily their job title or the hyperbole around it, it’s proving they are doing a great job at driving efficacy on their investments. With the foundation that marketing exists to drive business growth, we must consider our business strategy, goals and overall purpose. Marketing strategy has to be synchronised with business strategy. Whilst not rocket science, I believe this is why (in some instances) marketing fails to market itself and why some organisations have recently replaced the CMO with a ‘Chief Growth Officer’.. This shift is quite telling – in those cases it signals that the marketing function is not perceived as growth contributor or generating the required business outcomes by CEOs. Using the right language helps, of course, if your 2018 strategy is all about personalisation, storytelling, content or being data-centric, your CEO might think, “Great, but what does this mean to our bottom line?”. As Manjiry Tamhane – Gain Theory’s Global CEO – recently said at the Advertising Association’s LEAD 2018 conference in London, “‘Marketing must be seen to be the engine of growth for businesses.”’. What is our vision, mission and goal? What is the five-year financial plan and where are we on that journey? How are we going to get to our revenue goals – acquisitions, diversification, expansion, flotation, etc.? What are the business priorities this year and next? Demand Generation: what does your business need to achieve from an awareness and a perception point of view? Demand Conversion: following up on generation of demand, what do you need to achieve when it comes to customer intent and sales? It’s incumbent on marketers to factor in the current state of the business. In other words, are you in growth stage like Airbnb is or do you need to maintain market position like Hertz? To help drive the right insights, marketers must understand the metrics against which they will evaluate the success. 1. The ‘Right’ Metrics: Always link back to hard business data that ladder up to the business strategy and KPIs. For many companies, supporting data could point to sales revenue and profitability or a company’s share price. 2. Measure Holistically: Some marketing activity is demand generating while others are demand gathering. It’s important to understand how demand generating activity yields demand gathering activity in the future and how each channels contribution to the path to purchase. Don’t just measure the short- term response to media – advertising seeks to change people’s tastes and preferences, and will have an impact on sales revenue for a much longer period. 1. Organisational Alignment: It’s imperative to approach a marketing strategy consultatively, with partners who lead factors which will impact success. Smart questions to ask are: What can marketing do to help ensure success? What role can it play? Are we aligned on the same metrics that ladder up to business strategy? 2. Partner Alignment: Many CMOs and their teams lean on external partners to deliver their strategy including e.g. media agencies, PR firms, and specialists in content and , SEO. It’s incumbent on marketers to ensure full transparency on the goals, strategy and how you will measure success. As marketers we are constantly on a journey of re-invention in the face of consumer expectations, technology or market disruption. What remains constant is that marketing has to be seen as the engine of growth so the choices we make along that journey, need to always come back ‘home’ to the core business strategy. And as Bowie would say ‘The truth, of course, is that there is no journey. We are arriving and departing all at the same time’. Originally published on The Marketing Society website here. We all thought Google had injured paid search as we know it. The company rolled out significant changes to its desktop Search Engine Results Page (SERP) layout last year. Essentially, it removed the sidebar of paid search results to the right of the page, leaving paid search with up to four ads at the top and three new added ads at the bottom of the page, leaving organic search sandwiched in the middle. The sidebar change caused much panic among search marketers, who anticipated an increase in costs due to the reduced inventory, but some months in, there seems to have been minimal impact in cost. However, there is a casualty: paid search’s overlooked counterpart, Organic Search (SEO). Now pushed further down the page, reduced and generally maligned, it’s caught between two big paid search slices. The SERP changes were followed by the arrival of extended text ads, arguably the most significant change in many years, which gave advertisers double the characters available. It was designed for mobile experience and the name of the game is now making sure you are taking better advantage of the longer ads than your competitors. This often means knowing when not to use them, but generally speaking, more text should equal more information to searchers, more pertinent responders and thus better Click Through Rates (CTRs) and conversions. The quest to improve paid search has diminished the real estate for organic search results. And there is a less noticeable consequence: as traffic through free Organic Search decreases and is replaced by traffic through paid ads, there is actually a decrease in the incremental impact of Paid Search. What do I mean by this? Paid Search incrementally is the proportion of visits to a site, coming through the paid search channel, which disappears if the search ad doesn’t run. Incrementality excludes visits coming from alternative channels. A large factor in incrementality is the likelihood of getting to a site in the absence of a paid ad. Every action that Google takes to expand Paid moves traffic away from Organic. This is a zero sum game for visits: the same number of people are making searches, arriving at the SERP, but are ever more likely to click a paid ad. Marketers are paying for a proportion of clicks that would have come anyway via organic. Paid Search is cannibalizing clicks from Organic Search. This cannibalization has always been happening, but it is a growing and becoming a bigger problem for the advertiser. Google has addressed this by suggesting the cannibalization is small. It calculates that only 8 percent of paid ads have an associated organic ad on same page, but that still doesn’t address a number of key issues. Firstly, the scope for direct cannibalization may be smaller across all paid ads but it will be larger for the bigger brands that have a strong organic ranking. Secondly, it does not take into account indirect cannibalization. Paid search is usurping more traffic from Organic on the whole. Search can be a zero-sum game. The silent decline of SEO is matched by an increase of Search Engine Marketing. It’s generating a revenue boost for Google, but at the expense of everyone else. The more paid search, the more advertisers will pay for what was once free. AI and voice recognition promise to accelerate consumer adoption of smart devices, writes the global CEO of Gain Theory. Last year, CES was most aptly described as more of an evolution than revolution. The reverse is true in 2017. This year’s event was a complete game-changer. Behind the high-profile, attention-grabbing gadgets is a very clear commentary on how voice recognition, artificial intelligence and smart technology have combined to irrevocably change the relationship between brand and consumer for the better. “Smart” was the prevailing theme at this year’s event—and I saw (and heard) it everywhere. From lightbulbs to toasters and TVs to vacuum cleaners, the devices on display didn’t just “do”—they thought. Smart devices themselves are not the real game changers here. It is AI and, in particular, voice recognition, which promise to accelerate consumer adoption. Relevance, ease-of-use and trust have all been barriers to consumer adoption and, until recently, many smart devices were controlled by a smart phone. The ability to turn lights on and off via a smartphone has been around for some time but not necessarily widely adopted. Frankly, why get off the sofa to grab your smart phone to turn off the lights when there’s minimal additional effort to simply walk over to the light switch? Voice recognition was the crucial missing component—and it was all over CES. So it wasn’t surprising that Amazon’s Alexa stole the show. With seven microphones embedded into the Echo device and machine learning at scale with automated speech recognition, Alexa’s response is almost instantaneous in helping to control lights, thermostats, door locks, sprinkler systems and even order an Uber at the command of voice. Amazon has opened up Alexa for integration using a free API and, according to GeekWire, Alexa now has over 7,000 “skills” (Amazon’s word for integrations) from just a 1,000 in June 2016. With reportedly 5 million units of Echo sold to date and fast growing integration of Alexa with other devices, the ease of use and relevance of smart devices is likely to accelerate consumer adoption with some predicting that 2017 will be the year smart home goes mainstream. On another front, traditionally non-tech brands are moving into the smart device market, partnering with tech creators to fashion an array of new products. For example, Hair Coach, the world’s first smart hairbrush, is a collaboration between Kérastase (part of the L’Oréal Group) and Withings, who bring sensor technology and app connectivity to everyday products. The brush has microphones that pick up on various audible cues on the state of your hair and shares its data via a mobile app. There were also a multitude of toys and educational devices for children. Fisher Price announced its intent to launch a high-tech exercise bike for toddlers and Lego announced a robot-making toolkit for kids. Lego’s “Boost” toolkit enables children ages seven and up learn to code and build robots, bringing their creations to life by adding movement, sound and personality. Until recently, retailers held the keys to unlocking direct conversations with consumers. Having a detailed understanding of customers purchasing habits and demographics have helped them to communicate one-on-one with consumers, build strong relationships and increase future sales. Manufacturers, on the other hand, have remained relatively in the dark beyond the number of units distributed, relying on third parties to help inform them of the end sales volumes, pricing and demographics of customers. The advent of smart technology has the potential to change that by enabling the manufacturer to gain a deep understanding of customer behaviour after the product has been purchased (assuming the customer grants permission). Smart fridges will automatically reorder items when they run out. Automotive manufacturers will know when your journey cannot be completed with your current fuel levels and alert you when driving to your nearest/most convenient/cheapest gas station. Smart devices with voice recognition and AI will not just dramatically change the way in which consumers interact with computers, but also the way in which brands market to and build relationships with consumers due to the vast increase in data and resulting insights. Retailers of consumer electronics, manufacturers, energy providers, telco operators and others will have a real opportunity to build even stronger relationships with customers by helping them to navigate the smart home. Joining up all the devices, ensuring strong security, diagnosing and solving problems for consumers as they integrate new technology as well as providing on-going subscription based support will strengthen brand relationships if done at a level that results in surprise and delight. Machine learning, the ability to process data at scale and make intelligent decisions and recommendations in real-time will require a different approach to marketing in the future. On its 50th anniversary, CES has indeed (re)found its voice and it’s clear that there’s a major step change in the technology we interact with every day, with voice recognition likely to be the biggest revolution in our lives since the smart phone. —Manjiry Tamhane is the global CEO of Gain Theory. The latest IAB digital ad spend results have been released. In it is revealed the fact that in the UK paid search is now the largest advertising sector, above TV and even programmatic display. It appears as though the constant Google algorithm changes have managed to drive even more money into the pockets of Alphabet and their investors. But is paid search really advertising at all? In the old days, before the internet, if you wanted a pair of shoes you’d go to town, find a shop which sells shoes, and buy them. You might know you wanted a pair of Clarks shoes, or you might spend a bit of time to peruse a number of shops. Shops would spend money on rent, staff, store frontage, and a number of other tangibles to ensure they got your business. But this would never be included in a marketing budget. Now, you go online, go to clarks.com or search for clarks, or you search for shoes (you might specify a colour, or a size, or a type… whatever). The point is, none of this is new, it’s just a way of doing online what we’ve previously done in the past. You either know what you want and go straight to it, or you shop around a bit and eventually get what you want. The best advertising is about creating a demand for a product or a brand. Paid search does not create demand, it converts it. And whilst this is important, I would argue it’s not advertising. With budgets about to be squeezed again in the UK due to Brexit bringing with it price pressure this could be an important argument for brands to have.